Use the tutorial that can be found here to make your Hogwarts Signpost. Use acrylic paint on posterboard to create House Banners, but note that they will not be weatherproof. 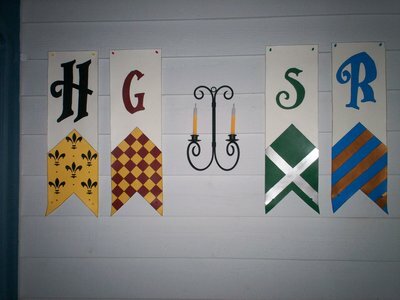 Combine the banners with a Hogwarts crest and a wall sconce that holds battery-operated candles. Gather up an assortment of owls from thrift stores. Cover a small table with burlap and arrange the owls on the burlap. Add an interesting lantern with a battery tealight. Print the word Owlery in a decorative font from your computer and put it in an ornate/old-looking frame from a thrift store. Choose one owl to put an envelope in its claws addressed to Harry Potter, Gryffindor Common Room, Gryffindor Tower, Hogwarts School, and suspend it on a string that runs overhead. 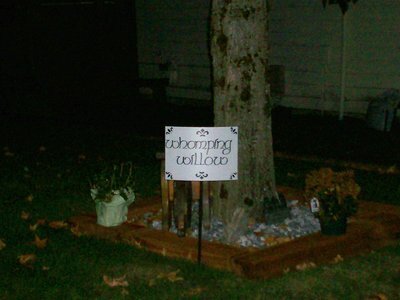 Buy a plastic for-sale sign, and in permanent marker on the back write "Whomping Willow" in decorative lettering. Paint a wooden dowel black, and duct taped the dowel to the back of the sign. Make up a variety of "notices" to put on your board. 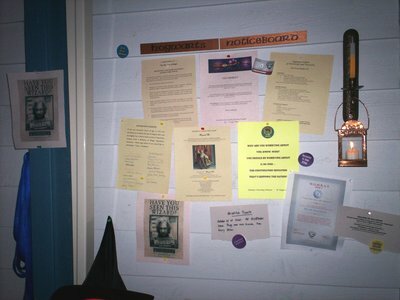 Examples are a first-year school supply list, an ad for U-No-Poo, a notice from the Ministry of Magic, an ad for skiving snackbox testers, an apparition lesson sign-up list, an ad for a Firebolt, a note from Harry about Quidditch tryouts handwritten on a scrap of parchment, and an ad for the book Magical Me. Paint two small pieces of wood and hand write Hogwarts Notice Board in decorative lettering, then randomly post the notices below them. In Old English Text print a full page sign that says "Hogwarts School of Witchcraft and Wizardry, Established 990 A.D."
Place it in an ornate faux wood frame from a thrift store. 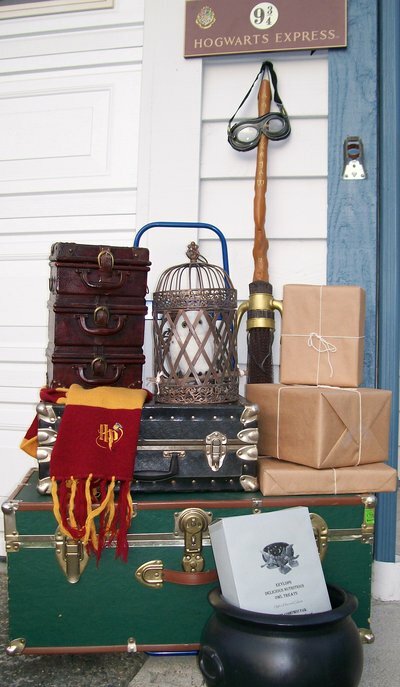 Licensed Products: NECO Platform sign, plastic Firebolt, Quidditch goggles, Gryffindor scarf. Thrift Store: Large trunk and two smaller trunks, plastic cauldron. Miscellaneous Purchases: White owl (online), round cage (Ross). I also wrapped three different sized boxes in plain brown paper and tied with string to represent Harry's purchases in Diagon Alley. I think I may write some store labels on them to make them more interesting. I also added a box of Owl Treats (below). Create the text for the cover of a box of owl treats on your computer, print it on parchment-looking paper, and tape it over an empty cracker box. Find a good color headshot of Harry online and enlarge it to a full page size. Cut it out and glue it to a sturdy piece of cardboard and attach two cardboard extensions on the front and back where Harry's neck would be. Put a Gryffindor robe on a sturdy hanger with a swivel head and hang it on a rolling clothes rack. Duct tape Harry's head to the front of the hanger and cover the neck area with a Gryffindor scarf to hide the tape and cardboard. Cover the clothes rack with a black plastic sheet and roll it close to the front window with Harry facing outward. Surrounding Harry place five artificial pumpkins on boxes and stools at different heights. 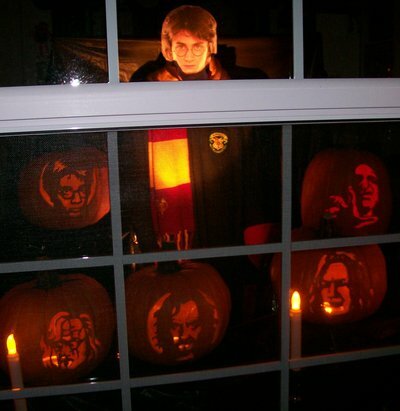 The pumpkins are carved to look like Harry, Snape, Mad-Eye, Sirius and Voldemort, all from patterns found online. Turn the lights out in the room and use an uplight to dimly light Harry. Add a couple of battery candles to the window sill. In the dim light it looks like Harry is looking out the front window. 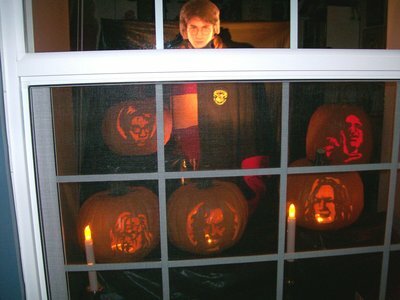 Tell the trick-or-treaters he's been put in detention by Snape, yet again, and he's sadly looking out the window, wishing he could be in Hogsmeade with his friends. © artisticmom's tutorial was taken with permission.